As a result of rising temperatures, changing and variable weather patterns are occurring, such as extreme temperatures both heat and cold, rises in sea level from melting of snow and ice, changes in precipitation resulting in flooding and drought, more intense hurricanes and storms, wildfires, as well as poorer air quality. Changes to climate patterns lead to current and imminent threats to public and environmental health with growing evidence and concern about impacts on human health noted if action is not taken. 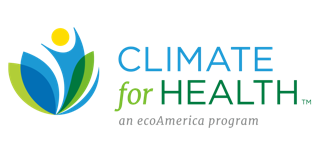 The Alliance of Nurses for Healthy Environments has partnered with ecoAmerica (eA) and Climate for Health (CfH) in supporting a Nursing Collaborative on Climate Change and Health which aims to join national nursing organizations and to elevate nursing leadership in addressing climate change. With support by national organizations representing nurses across differing specialties, there is great potential to bring a health-focused discussion to national climate change policy, regulations and initiatives. ANHE’s aim is to inspire nurses to be leaders in helping our patients, our communities, and our healthcare institutions engage in climate change mitigation activities and in preparing for potential effects of climate change. If your organization would like to join the Nursing Collaborative please contact Cara Cook at cara@enviRN.org. For individual nurses that would like to take action, join us in the Nurses Climate Challenge! The Nurses Climate Challenge is a national campaign to mobilize nurses to educate 5,000 health professionals on the impacts of climate change on human health. Moms Clean Air Force and ANHE have created a brochure for health professionals that outlines steps for advocating for clean air and family’s health. Certain populations will be extremely vulnerable to health impacts associated with climate changes including children, the elderly, low-income populations, and individuals with chronic health conditions. Additionally, with the range of climate regions across the United States, climate change will pose variable risks throughout the country. Refer to ANHE’s 2016 report titled “Climate Change, Health, and Nursing: A Call to Action” for a further review of the science of climate change and relation to health, specific health impacts by U.S. region, and more information on how nurses can get involved in addressing this issue. Check out the Climate & Health 101 resource page of the ANHE Climate and Health Toolkit to learn more. The National Institute of Environmental Health Sciences’ website lists the health impacts of climate change, along with strategies to reduce health impacts, and identifies areas for fu­rther research. 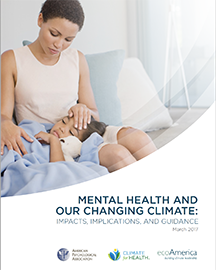 The Centers for Disease Control and Prevention’s website lists the effects of climate on health and provides fact sheets to use for further education. The Intergovernmental Panel on Climate Change works to advance understanding of climate change and impacts by reviewing and assessing current scientific, technical and socio-economic information. View their latest assessment report here. The National Climate Assessment, a report developed by over 300 experts and a Federal Advisory Committee, details the impacts of climate change across the differing regions of the United States. The World Health Organization’s website identifies what is being done on a global level to address the threat of climate change and offers actions to take to advance climate solutions. Learn how to apply health promotion interventions in caring for the planet and the systems in which human existence depends at Planetary Health Now! Climate Change and Nursing is a video series to introduce you to the health threats posed by climate change and the associated actions that nurses can take, and to consider the ethical obligation of nurses to act on their knowledge. Adoption of both climate adaptation and mitigation strategies are necessary to protect the health of the public against the negative impacts of climate change. Climate adaptation strategies include preparing for and responding to threats posed by climate change, whereas mitigation strategies aim to eliminate or reduce threats. Adaptation strategies are necessary to ensure community and healthcare institution preparedness in adapting and responding to impacts resulting from climate change. 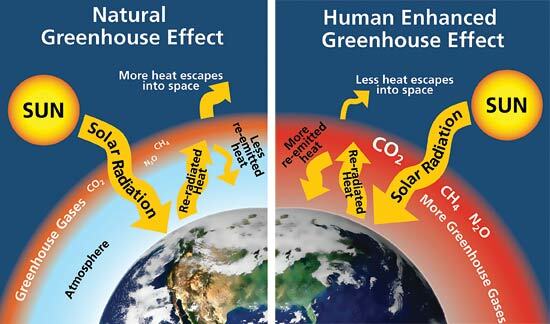 Mitigation is necessary to halt further warming of the Earth and worsening climate patterns. To ensure communities and healthcare facilities are prepared for impacts of climate change, including natural disasters and flooding, nurses can work with local and state health departments and healthcare facilities to ensure that disaster preparedness plans and training are in place in the event of disruption in community infrastructure or health services. Nurses can further facilitate the development of statewide climate adaptation plans and action plans for extreme temperature events to ensure that people have access to necessary care. There is still a great amount of work to be done in the healthcare sector to mitigate the effects of climate change. The healthcare industry accounts for almost 10% of the total carbon dioxide emissions in the United States. [v] Nurses can work within institutions to reduce the use of fossil fuels by promoting energy efficiency in operations and building design, along with encouraging the use of clean energy when possible. Hospitals can utilize purchasing power to purchase healthy and environmentally sustainable foods to serve to staff and patients to promote health and reduce their carbon footprint. 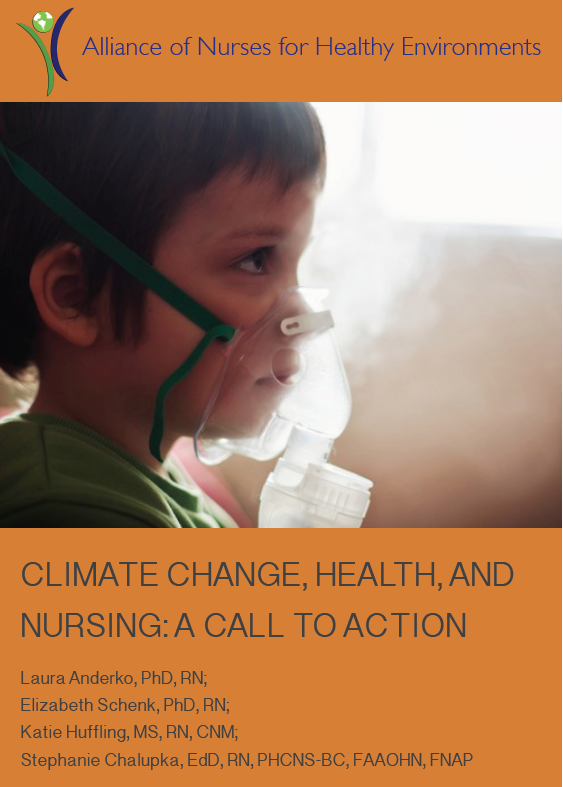 Further areas to address climate and health impacts needing nursing involvement include developing assessment tools to assess environmental impacts on health, assisting in research efforts to further the science on climate and health, and furthering education of fellow nurses, health professionals, patients, policy makers, and the public on climate change and strategies to reduce impacts. Nurses can also advocate for public-health backed policy and ensure that health is placed at the forefront of decision making as it relates to climate and health. Learn more about what nurses can do to address climate change through the ANHE Climate and Health Toolkit. View the Climate and Health Alliance’s discussion paper that proposes a thematic framework for a National Strategy for climate, health and well-being, which includes six key action areas. The Lancet Countdown: Tracking Progress on Health and Climate Change, an international research collaboration, dedicated to tracking the world’s response to climate change. Health Care Without Harm and Practice Greenhealth’s report “Addressing Climate Change in the Health Care Setting: Opportunities for Action” discusses how healthcare settings can implement changes to address and mitigate the effects of climate change. “Healthy Hospitals, Healthy Planet, Healthy People: Addressing Climate Change in Healthcare Settings” is a report developed by the World Health Organization and Health Care Without Harm that discusses the impact of the healthcare sector on climate change and identifies solutions that facilities can take to reduce their carbon footprint. The CDC’s Building Resilience Against Climate Effects (BRACE) framework provides a planning process for health officials to develop and put into place preparedness strategies for communities to protect against climate and health threats. The Georgetown Climate Center has complied information on the status of state and local adaptation plans in the U.S. and discusses the progress made in carrying out plans by state. [iii] Adlong, W., & Dietsch, E. (2015). Nursing and climate change: An emerging connection. Collegian, 22(1), 19-24. [iv] Allen, P.J. (2015). Climate change: A review of potential health consequences. Primary Health Care, 25(7), 34-40.